We are huge Ella's Kitchen fans and always have been ever since C was little. We will continue to use Ella's Kitchen products when E is weaning too. 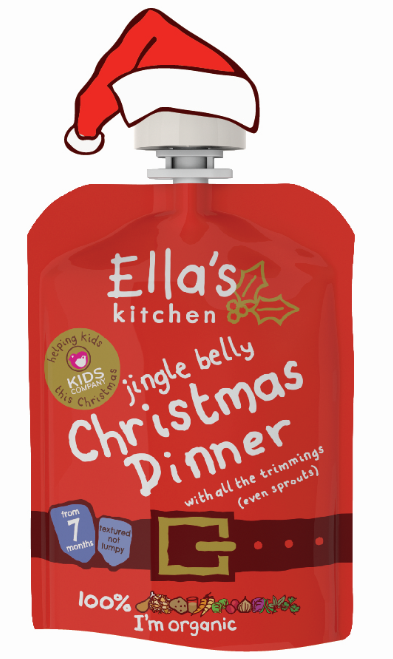 This year, for Christmas, Ella's Kitchen have developed a new baby pouch - jingle belly Christmas dinner! The pouch is suitable for babies aged 7 months+ and contains turkey, carrots, parsnips, red cabbage, potatoes, onions, green beans, cranberries and even sprouts! At least 30p from each pouch purchased will be donated to Kids Company to provide food for disadvantaged children and their families on Christmas Day. The limited edition Ella's Kitchen jingle belly Christmas dinner pouch is available on the Ella's Kitchen website or at Tesco for £1.40.